They look like they are moving in the right direction. Wonder why they feel like this is needed? Granted, I haven’t watched any Kings games in a while. This seems like a Kings move to me. Why keep a good younger coach when you can fire him and see if Isiah Thomas or David Blatt are available. Lol. This is exactly how Jason Kidd got fired by Nets. Nets traded him to MIL for 2 second round picks. Their PT did not change over the year, 25 for Bagley & 23 for Bjelica. However Bagley missed a number of games with injury, so the argument that he should have played more is a miss. He was not up for the minutes he was scheduled for. Nor was their PT responsible for the change in W-L.
Predictably, Bjelica has significantly higher on/off, VORP, and BPM, with Bagley in the minus, While Bagley has the better PER, 18.9 to 15.4. So Joerger was right and it was just a matter of when to give up & play the kids. Probably Williams was too quick and Joerger too slow. But they probably doomed each other with the debate. With a draft class that could potentially rival the James bosh wade Anthony class of 03 you could make a strong argument playing the kids and tanking would be the right move, esp if you added a Cameron reddish or rj Barrett to the group of fox hield Bagley and cauley stein. I have not heard so much optimism for the 2019 class. The rise of ZionW certainly helps, but some others have not developed as hoped, and it was generally thought weak at the start of the year. Would love to see Walton go there giving him an opportunity to remain in the same division as the Lakers. Kings’ young roster without a Prima Donna would be just right for his personality. So dumb. Kings actually show signs of life this year. Overachieved. Were a great watch on NBA league pass. Typical stupid Kings move. Just sell the team. Walton isn’t necessarily a lock to be replaced? I won’t believe it until it comes from LeBron! At least they still have Vlade. He will lure Kristaps. 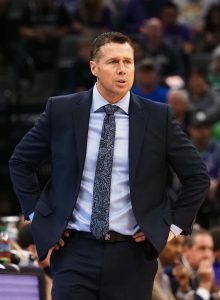 Joerger won’t be out of work long. He’s a good coach. Cavs would be wise to at least interview him. Finally they got rid of Joerger, took too long, now they can only get better from here!! !